A few weeks ago, I posted an update on Facebook to say that I had finally cut my tie to the corporate world. The response was amazing and I felt truly grateful for the wonderful words of support. Given the response, I wanted to share with you my journey and my insights that lead to this decision. While it is a personal story and much longer than my other blog posts, I hope that it may inspire at least one person to make the Fool’s leap and become a Tarot professional too. It’s a new dawn, it’s a new day, it’s a new life for me. And I’m feeling good. On August 8, 2012, I decided to quit my corporate (six-figure income) job and become a full-time Tarot professional. Ahhh, liberation! Right throughout my life, I have always been academic- and career-focused. I completed a Bachelor of Commerce with Honours at one of the best Universities in Australia and then started my career as a business graduate in one of Australia’s largest companies. 18 months later, I returned to university to complete a Master of Human Resource Management, where I was awarded both the Highest Achieving Student for the Master of HRM program and the Dean’s Commendation for graduating in the top 5 percent of all business and economic graduates. In addition to my first graduate role, I worked as a management consultant, travelling around Australia and even to Asia, working for a broad spectrum of clients and having an amazing time. I later left the consulting world to join another large corporate for several years. And, right throughout my life, I have also read the Tarot cards. And as I was writing employee engagement reports and advising companies on Human Resource strategy, I was also doing Tarot readings online. For the first 10 years or so, Tarot was really a hobby – something I enjoyed doing as a creative outlet to my corporate work, but that didn’t really earn me a living. Things started to happen! Visitor numbers increased and I was starting to really connect with more and more Tarot enthusiasts. 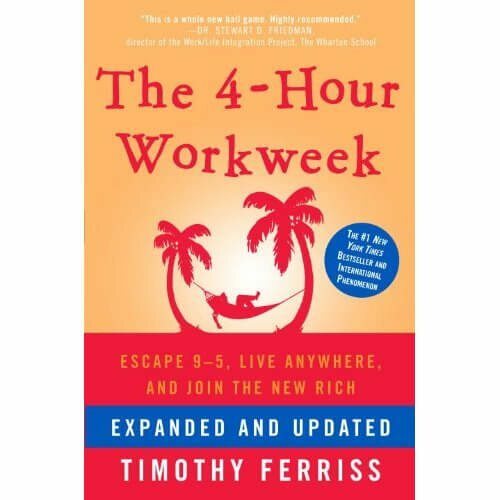 Then, at the start of 2011, I read Tim Ferriss’s “The 4 Hour Work Week”. It rocked my world! I looked at my life in a completely different way, one where you didn’t live to work, but you worked to live. You decide what your dreams and goals are, how much money you need, and how you can do what you love doing to generate the money to support your goals. It isn’t about earning as much money possible. It’s about funding your dream goals. After reading Tim Ferriss’s book, I started learning more and more about how I could turn my Tarot hobby into a business and how I could leverage more passive income (more about that later). As a family, we also set ourselves a ‘dream goal’ to live overseas for six months in 2012 (and that’s how this amazing trip to Spain has come about!). All inspired by Tim Ferriss’s book. With another baby due in July 2011, I went on maternity leave from my corporate job and invested myself even more into my Tarot business. 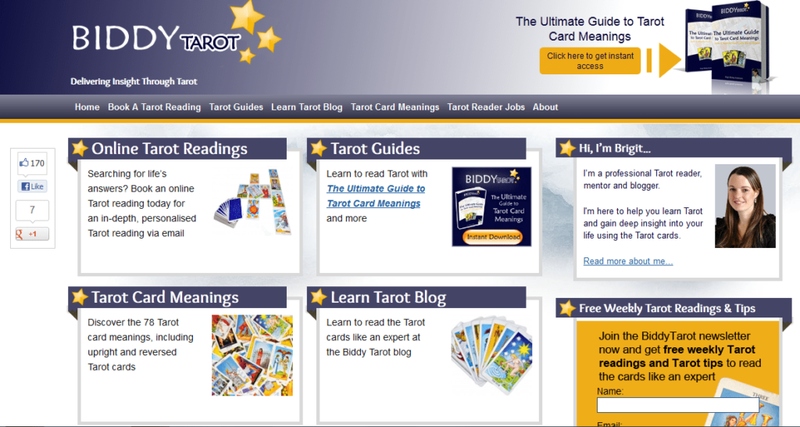 I launched The Ultimate Guide to Tarot Card Meanings only six weeks after Zara was born. I also launched a new website design at the start of 2012 which now attracts over 70,000 visitors a month. In March 2012 we bravely embarked on our six month trip to Spain. This trip has been largely an ‘experiment’… Can we ‘live the dream’ as a family overseas? Can we support our travel with online work? 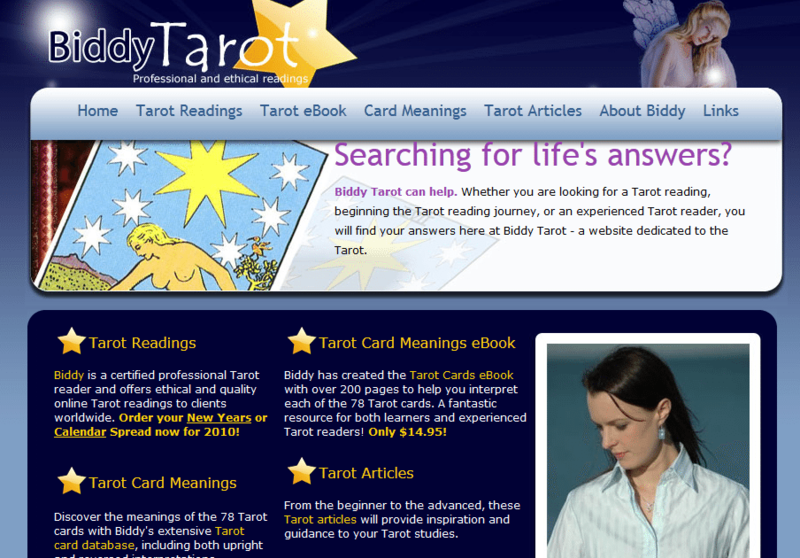 How much could Biddy Tarot grow… while travelling? And ultimately, could I quit my corporate job and set up as a true business owner, supporting my family with my income? As the months passed by, the results were looking more and more promising. Our travels were going as well as could be expected for a young family, I was able to keep working while travelling and we were even paying off our mortgage at home! But at the same time, I was becoming more and more jittery. I had set myself a monthly income goal that was required before I could well and truly quit my corporate job. And while each month I would hit those goals or exceed them, I was still petrified about making the final decision to quit. I had in my head that I could still return to work three days a week, run my Tarot business, teach childbirth education classes and be a great mum, wife and friend – all to maximise my earning potential. I thought, “We have just got to earn as much money as possible while we can.” Plus, I didn’t want to through away all my years of academic and career investment by letting go of my corporate job. On August 8, 2012, all that changed. 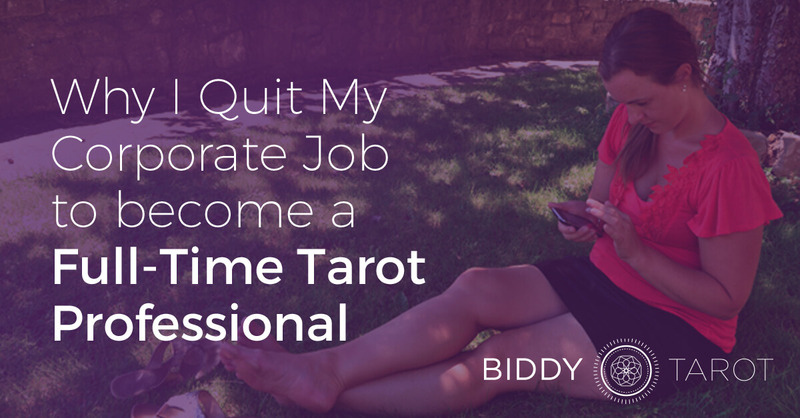 I finally woke up that morning and said to myself, “I am going to quit my corporate job and be a full-time Tarot professional.” It was one of the most liberating, yet very scary, moments in my life! I don’t think there is ever a ‘perfect’ time for anything. There’s always some reason why you shouldn’t do what you want to do at any given point. But I suppose it is when the scales tip and it finally feels like there are enough factors in your favour for moving forward. This is where the intuitive side of me comes into play! I started noticing more and more synchronistic events occurring around me that were telling me it was time to quit and focus on my business. I had one day of the most out-of-this-world earnings on Biddy Tarot and from there it continued to grow at a ridiculous rate. This was immediately after me questioning how much money we would need to earn for me to give up my corporate job… and then the Universe replied! Alone, they may seem relatively minor and inconsequential. At first, I ignored them, replacing them with more validation about why I needed to return to work. But one morning I woke up (immediately after Mercury Retrograde had finished) and it felt like something had ‘popped’. “Right, I’m doing this.” Finally I paid attention to everything that had happened, and I listened. My business is continuing to grow, month by month, and with more projects either in the pipeline or in my head, the potential for further growth is very high. I think it’s very courageous for people to quit their day job and start a business. For me, I wanted to be sure that I already had a solid income before I made the switch. My husband and I also worked out how much we would need to earn in order to meet our monthly living costs. That became my income goal which I had to consistently surpass in order to cut my tie to the corporate world. After several months of achieving and exceeding that goal, I felt like it was a pretty good sign that the success would continue. I am in a good position now where my income is not just coming from a single source (e.g. online Tarot readings). 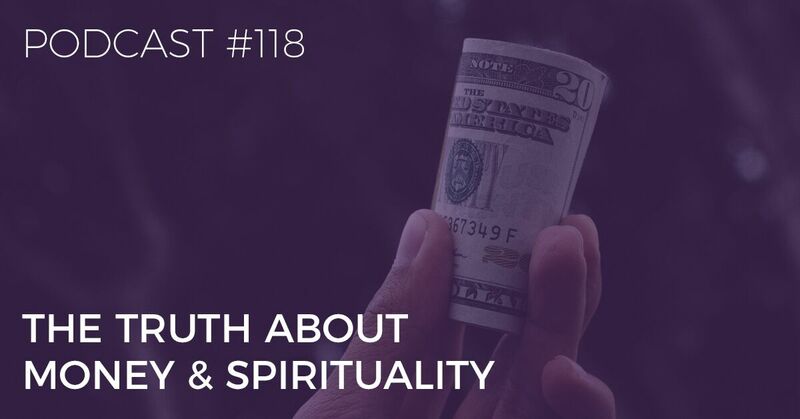 The risk with a single-source income is that if, for whatever reason, sales began to decline for online Tarot readings, I would be left up the proverbial creek. Instead, I have multiple streams of income from multiple sources (Tarot readings, eBook, advertising, etc.). I am also in the planning stages for diversifying even more. And note that I call myself a “Tarot Professional” in this post. I am not simply providing Tarot readings, but I am creating a business focused on Tarot. What’s even better is that my income is a mix of passive and active income. Passive income is things like the eBooks and advertising where you don’t actually need to ‘do’ something to earn the money (that said, eBooks take a huge initial investment). Passive income is fundamental to a “live more, work less” lifestyle. It also means that you can invest time into things like blogging which don’t necessarily make any direct income. Active income is where you are being paid for your time (e.g. Tarot readings, coaching, etc.). It’s work I love, but if this was something I wanted to grow, I need more ‘me’s’ to do it (which isn’t always possible!). I’m in my 30s with a husband, 1 year old and a 3 year old. It seems to be quite ‘normal’ for women to take a break from the workforce to look after their kids until school age. And rejoining the workforce a few years later (if that is what I decide to do) shouldn’t be an issue. This is also a great time to take extended ‘holidays’ of 6 months or so overseas, before the girls get to school age. So it is highly likely we’ll do this Spain trip all over again in 2013. Knowing that I would only be in my corporate job until the next European Summer made me think I may as well just quit now, rather than in 5 months’ time. I am still finding it difficult to actually say it in words, that I was once a management consultant and now I’m a Tarot consultant. It’s not exactly the career progression path people expect. And why would you leave behind a career that you had invested so much into and were doing so well in, to go and run a Tarot business? I keep asking myself, “Have I just completely ‘flaked out’ and joined the airy-fairy crowd everyone seems to be afraid of? Have I just dumped all my corporate experience, reputation and education to go off and ‘join the circus’?” Am I being dreamy and unrealistic? But what it comes down to is that I have had a significant mindset shift on a number of levels. I have had to separate from the ‘normal’ way of seeing the world and think differently about my life and my priorities. I had to break free from the status quo. 11am – Go out as a family to a new town, restaurant, the beach – wherever! 3.30pm – Go out to the park, the beach, the local tapas bar – wherever! If we want to go out for the whole day, I just do my work in the evening. Or, if I’m too tired or just want to relax, I don’t do any work at all for the day (although, I have to admit, this is rare!). All the while, meeting or exceeding my income goals that are required to support my family. I can’t wait to bring this back to my life in Melbourne, too. Even better, my husband is not working so we will have seven days a week to be a family, not just the usual 2 weekend days. We love to travel. But travel costs money, right? Well, what if you could earn while you travel? That’s the benefit of a mobile income! This is one of the best things about my business – it is completely ‘location independent’. I don’t have to be in a specific location (so long as it has internet) to earn an income. I can read the cards anywhere, any time (more or less!). So, why not invest in building a mobile income rather than tying oneself down to a location dependent income? That’s been a large part of my decision-making process. Something that has really ‘clicked’ for me is that we are here to make a life, not just a living. It isn’t about earning as much money as possible by watching your salary grow and your career status increase. It is about creating a life that is meaningful and connecting with the people we love. I came out of university fuelled with the idea that my income would continually increase and that this would be a sign of my success, not just in my career but in my life overall. If you’re earning heaps of money, you must be a valuable member of society, right?! But what I have come to realise is that it’s OK not to earn loads of money, so long as the basics are covered. It doesn’t matter if the person next to you is earning three, ten or even fifty times as much as you. They might only get to see their family and friends on the weekend, in between checking the Crackberry Blackberry. What matters is that you are earning enough to sustain your lifestyle (with a little extra savings for a ‘rainy day’) and you’re investing the rest of your time with people you love doing the things you love to do. So what if my income goes backwards? At least I know that I can spend the day at the beach with my family any day of the week or I don’t have to rush the girls off to childcare so I can get into the office. Another one of my favourite books “Awakening the Buddha Within” by Lama Surya Das. Inside, the author talks about “Right Livelihood” as one of the seven steps to enlightenment in Buddhism. It really made me think about where I should be investing my time and energy. A. In a large corporate whose aim it is to generate $6 billion in profit. B. In my own business, working with individual people to inspire and guide them using the Tarot. It is just so inspiring to receive daily personal thank-you emails from visitors to Biddy Tarot or even the occasional “You changed my life” email. So much more inspiring than looking at spreadsheets every day to see how much money the company could save by reducing costs. You know, one of my fears with this switch is that Tarot reading is not a ‘real job’! But, when you take into consideration “Right Livelihood”, isn’t a ‘real job’ helping people bring meaning into their life and making a difference? I’ll be honest. It might look courageous making this bold move, but I am still worried about what lies ahead. What if I change my mind and want to go back to corporate? Will it be easy enough to go back? I guess many mums take 4-6 years out of the workforce until their kids are school age, so why should this be any different? How on earth do I explain my previous position “Tarot Professional” to a bunch of managers in suits sitting across the interview table? I know that the fundamentals of what I do as a business owner is valuable to any business, but Tarot?! Will we have enough money? What if things go pear-shaped financially? Thankfully, we’re in a pretty good position, financially, that if things were to go pear-shaped, we have a few backup plans. That said, what’s the worst thing that can happen? I go and work as a checkout chick? You can always hustle to get more money. Am I wasting all of those years studying and working, just to become a Tarot reader? Rationally, I know that it is probably all of those years studying and working in business that is contributing to my success with Biddy Tarot. I just have to keep reassuring myself of this! I am absolutely thrilled at the concept of being able to invest my work time fully into Biddy Tarot. It means that I can spend more time connecting with you and all the Biddy Tarot enthusiasts, and being part of your Tarot journey. Public speaking – presenting at Tarot Guild of Australia workshops in Melbourne, getting onto blog radio programs like Beyond Worlds, and potentially one day presenting at a Tarot conference somewhere in the world! To end, I want to extend a huge, heartfelt thank-you to you, the Biddy Tarot reader, for supporting me in my journey and for making this life change possible. There is absolutely no way that I could have done it without you and for that I am truly grateful. I have had an amazing journey and am so grateful to be in the position where I can now be my own boss. But guess what? You can do it, too! Whether you’re just starting out as a professional Tarot reader or you’ve got an established business but want to become full-time, I can help. I have worked hard to make Biddy Tarot what it is now and have learned a huge amount along the way. I am now available for private 1:1 Tarot business coaching to help transform your Tarot business. Click here to find out more.